UCSF news article by Laura Kurtzman, Senior Public Information Representative at UCSF. UC San Francisco is adding 15 new all-electric, zero-emission transit vehicles to the intercampus shuttle fleet that serves UCSF employees, faculty, students, patients and guests. These electric shuttles will replace aging gasoline- and diesel-powered shuttles, making a quarter of the University’s fleet electric. Each year, the UCSF shuttle network transports about 2.5 million passengers and traverses close to one million miles throughout the city. By retiring these older shuttles, the battery electric buses will remove 60 metric tons of CO2 from the air per year and help to improve air quality. The University aims to have an all-electric fleet within 10 years. The first electric buses will begin servicing routes on Oct. 1, starting on the Red line. In the weeks ahead, more electric buses will be added to existing routes, with 10 buses expected to be deployed by the end of the year on the Blue, Bronze, Gold, Grey and Red routes. All 15 buses should be deployed during peak hours by the spring of 2019. The University invested $8.2 million, after state and local rebates, in the 15 new buses, EV chargers, electrical infrastructure and transit yard enhancements. The buses run for 200 miles per charge and can be fully charged in less than three hours. 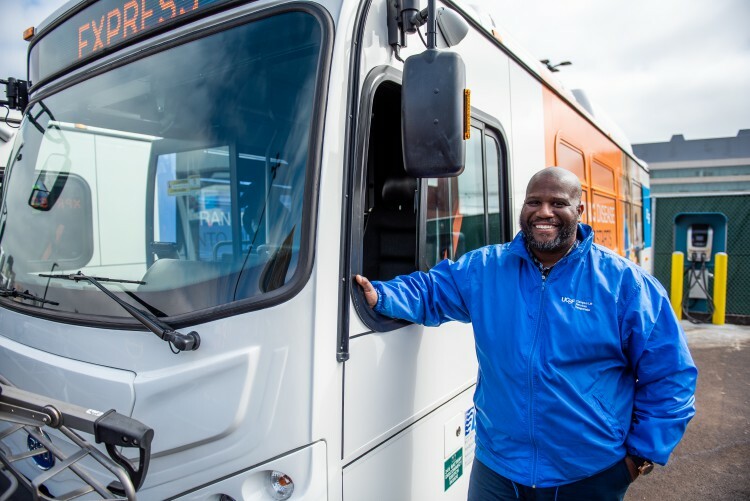 The new buses also have a larger passenger capacity than the current fleet, which will help reduce the number of shuttles circulating throughout the city, as well as impacts on the neighborhoods near UCSF campuses. “As we begin to use our electric buses, our neighbors should feel the positive effects of a cleaner and quieter shuttle fleet,” said Erick Villalobos, director of transportation at UCSF. The new fleet includes 15 K7 model, 30-foot battery electric buses from Build Your Dreams (BYD), a Los-Angeles based company with manufacturing facilities in Lancaster, Calif. The BYD transit bus design is fully tested and approved to be used by transit agencies in the United States, and the K7 model is used by Stanford University, UC Irvine and California transit agencies in Long Beach and Antelope Valley, Calif.